The world has been the victim of a monstrous scientific error that has understated the dangers of radiation, writes Chris Busby. Following the Hiroshima nuclear bomb, investigators used ‘controls’ who had been exposed to high levels of ‘black rain’ fallout to understate the health impacts of radiation. This bogus science still underlies risk models today. The effects of internal exposure due to intake of tiny radioactive particles are more severe than those of external exposure, explaining the difference between the official criteria and the actual state of the survivors. 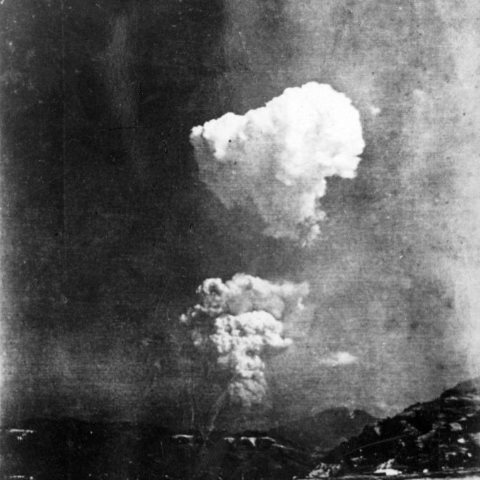 Picture found in Honkawa Elementary School in 2013 of the Hiroshima atom bomb cloud, believed to have been taken about 30 seconds after detonation of about 10km (6 miles) east of the hypocentre. Photo: Honkawa Elementary School / Wikimedia Commons. At the peak of the atmospheric nuclear testing, between 1959 and 1963, the US and Soviet megaton tests rained down Strontium-90, Caesium-137, Plutonium-239, Uranium micro-particles, and all the other fallout from Pandora’s nuclear box. This caused increasing panic about what the genetic impacts of the bomb tests, what effect they might have on the gene pool of the human race. Nobel scientists Linus Pauling and Andrei Sakharov were warning of catastrophic effects from Carbon-14 down the line. The geneticist Theodor Dobzhansky warned about the alteration of the genome, drawing attention to the seminal work by Herman Muller which showed chromosome damage in fruit flies exposed to X-rays. But the military were pushing forwards, determined to have their bombs – and forcing in 1959 an agreement between the World Health Organization (the doctors) and the International Atomic Energy Agency (the atom physicists) which left the physicists in charge of human health (which they still are). At the time, although experiments had clearly shown genetic effects in animals exposed to radiation, evidence from the ‘experiments’ at Hiroshima and Nagasaki unexpectedly (and curiously) showed that human children were seemingly unaffected by their parents exposures to extremely large doses of radiation. It is this result which the Ministry of Defence refers to in its response both in the recent court cases and also in its comments in the Sunday Mirror articles about the increased congenital disease rates in the UK Test Veteran children. The MoD says: “other research shows no effects”. But is the other research valid? The studies were set up and run by the US-funded Atomic Bomb Casualty Commission (ABCC), which transmuted into the present Radiation Effects Research Foundation (RERF). The two organisations examined negative birth outcomes in those exposed to ‘external prompt radiation‘ from the A-Bomb – the gamma ray burst from the nuclear explosion. The method was to compare three groups which we can call ‘big dose’, ‘medium dose’ and ‘no dose’ (the controls – known as ‘NIC’ = ‘not in city’). The results (shown in Table 1 below) showed only a weak increase in impacts on the basis of dose. This implied that even huge radiation exposure had only minor health impacts. Table 1: Untoward pregnancy outcomes (stillbirths, malformations and neonatal deaths) among the children of atomic bomb survivors 1948-1954 by fathers’ dose. Mothers’ dose is assumed by RERF to be zero (not in city). (Rate per 1,000 births). No allowance was made for exposure to fallout or rainout because it was stated there was none. Infact, heavy ‘black rain‘ containing Uranium oxide particles and highly radioactive fission products fell over a wide area extending to 5km to the west and northwest of the bomb blast. This Uranium – which remained decades later in the soil as a long term marker of the weight of fallout – was measured by my friend Prof Shoji Sawada and colleagues in 1983, and published in the Journal of Radiation Research in the paper ‘Uranium isotopes in Hiroshima black rain‘. His later paper ‘Cover-up of the effects of internal exposure by residual radiation from the atomic bombing of Hiroshima and Nagasaki‘ was published in the Journal Medicine, Conflict and Survival in 2007. The black rain contaminated all three groups. So the apparent weakness of the effect from gamma way exposure has a simple explanation – it was overwhelmed by a much stronger effect from the black rain. Why no comparison with all-Japan data? This defect could have been rectified had the RERF (or their predecessors the ABCC) compared their findings (birth effects, cancer) with the national Japanese population to obtain National Standardised Ratios. They never did this. But health researcher Tony Boys did – and showed that adverse birth outcome rates in the Hiroshima children were at about double the rates published for all Japan at the time. This means that there were indeed birth defects and infant mortality increases in the Hiroshima children. The effect was not picked up in the statistics because of the ABCC’s faulty choice of control group. Nevertheless, information about the fallout-related increase in infant mortality in the USA and UK that was discovered by my friend Ernest Sternglass reached President Kennedy who quickly negotiated a halt to the tests in 1963 – just after the Soviets had exploded the infamous 40 Megaton ‘Tsar Bomba’. The period 1959 to 1963 was an unfortunate time to be born. But we were told not to worry: the follow-up of the Hiroshima children, and their seeming immunity from genetic effects of radiation, became the gold standard for regulatory limits. The Hiroshima findings formed the evidential foundation of the 1952 risk model ofInternational Commission on Radiological Protection (ICRP) – its ‘International System of Radiological Protection‘. It has thus been employed by agencies and governments to permit the nuclear industry and military to contaminate the environment, you and me and our children, cats and budgerigars, and indeed the whole planet and its inhabitants, at levels which many have shown cause cancer and genetic damage – and to deny evidence of these impacts on the basis that ‘the dose is too low’. What is the ICRP’s true purpose? Given the serious scientific errors that underlie the ICRP model, we should not be surprised that is wildly incorrect, nor at the constant discrepancies that occur between its predictions, and observed outcomes. These discrepancies are greatest for low levels of radiation from internal sources, which the ICRP judges to be essentially harmless. Actual risk factors may be as much as 1,000 times greater than the ICRP model suggests. I am prepared to accept that the initial publication of the health risks caused by human exposure to radiation, based on the Hiroshima data and its faulty choice of controls, is a genuine scientific error – if a serious one that demands immediate correction. But ICRP’s unswerving adherence to a bogus risk model based on the fallacious Hiroshima findings is something else altogether – all the more so since the model is being used by the global nuclear establishment to deny the deaths of millions that have been caused by radioactive exposures. But increasing numbers of people believe that the ICRP’s true purpose is to conceal the true scale and nature of the health impacts of radiation – and so create ‘consent’ for the world’s continued radioactive pollution by the nuclear power and nuclear weapons industries. Chris Busby is the Scientific Secretary of the European Committee on Radiation Risk. For details and current CV see chrisbusbyexposed.org. For accounts of his work seegreenaudit.org, llrc.org and nuclearjustice.org. The report: ‘Miscarriages and Congenital Conditions in Offspring of Veterans of the British Nuclear Atmospheric Test Programme‘ was published last week in the peer-reviewed journal Epidemiology Open Access. Owing to a technical fault the full paper has been sporadically unavailable. A PDF is also available here. Dr Busby is also the author of Uranium and Health – The Health Effects of Exposure to Uranium and Uranium Weapons Fallout. Documents of the ECRR 2010 No 2, Brussels, 2010.